Happy Halloween to all Marvel Monster fans! If you've visited here before, you will know of my love for the Man called Morbius the Living Vampire! One of the first vampires created for Marvel's super-hero line, he started in Spider-Man. I've already done articles on his origin, but the above cover is a good one (not a great one) from Dave Cockrum and Al Milgrom. At first I believed this was a Gil Kane cover as the Morbius head in the background looks like his style! Thankfully a reader named Abney corrected me. How cute is that? A Marvel Funko Pop figure of Morbius! If you're not familiar with the Collector Corps, it's one of these box services - they ship you a box every 2 months, it comes with 1-3 Funko Pop figures, a comic book variant (this month it was Invincible Iron Man #1), and a t-shirt. The theme this month was villains. In addition to Morbius, they had a cute Loki figure and a small Venom key chain. The box containing the figure is nifty, too. Now you have to realize how great it is that they selected Morbius for this box. The theme was villains; I kept wracking my brain on who would be included. Dr Doom? Magneto? Morbius fits perfectly with the Halloween theme. 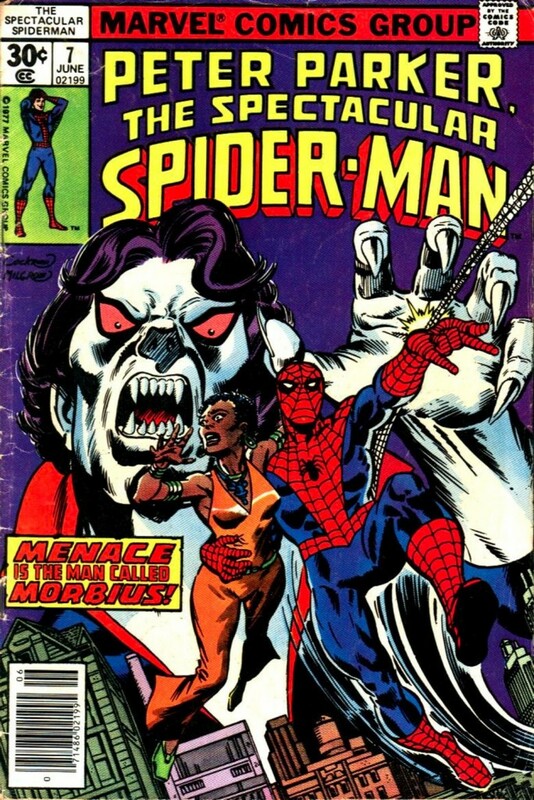 I wonder how many people even know Morbius now? He had a limited series years ago, made a few Spider-Man appearances in recent years, but that's it. Someone I know who gets this box without much Marvel history had no idea! I think it's pretty cool they chose Morbius, makes a long time fan happy. The cuteness has grown on me, too. Nuff Said! Cover is by Cockrum/Milgrom....look below the logo box in upper left. Of course now I see the signature! Thank you. I was thrown off because the Morbius head does look like Kane. Yet I can see Spidey and the woman look like a Cockrum drawing. I will correct this.